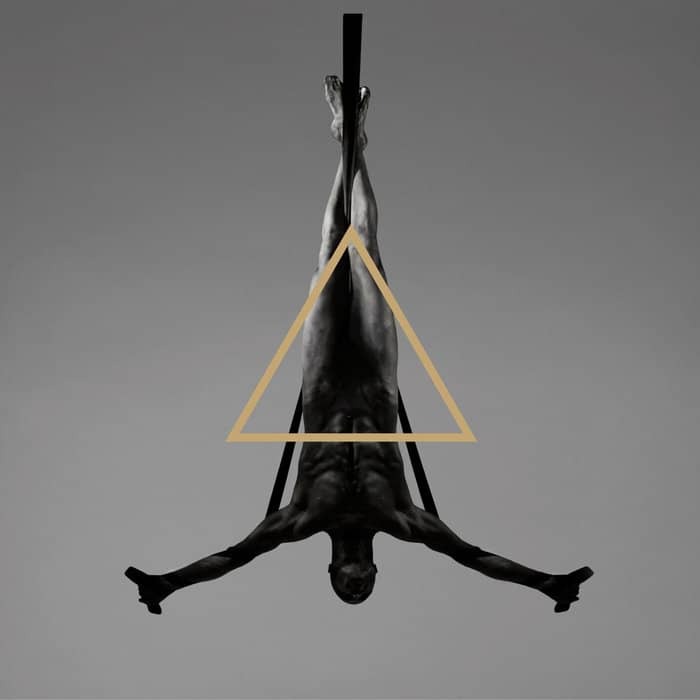 The Swiss avant-garde black metal band Schammasch – name taken from Šamaš, the Mesopotamian God of Justice – will release their third full-length album, simply titled Triangle, on April 29th. As the name suggests, the concept of this highly ambitious work is tripartite, each side clocking in at 33:30. Yes, that makes for more than a hundred minutes of music! 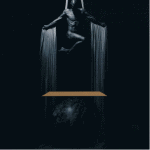 Inspired by Richard MacDonald‘s sculptures, the cover album portrays circus artist Sasha Krohn, falling into nothingness, photographed by Ester Segarra. Every side of the Triangle has its own identity, and feels very unique, they deal with various concepts, pertaining to life, death, and the balance of all things. It’s a very spiritual journey, deep, and possibly life-altering. Let’s decorticate it, in order to understand it. The first side consists of six songs on the subjects of loss, death, and acceptance. Musically, it is like the more traditional, albeit progressive-sounding, black metal sound that we’ve heard on their previous albums, Sic Lvceat Lvx and Contradiction: dissonant chords, blast beats, harsh vocals, and a wide array of riffs. 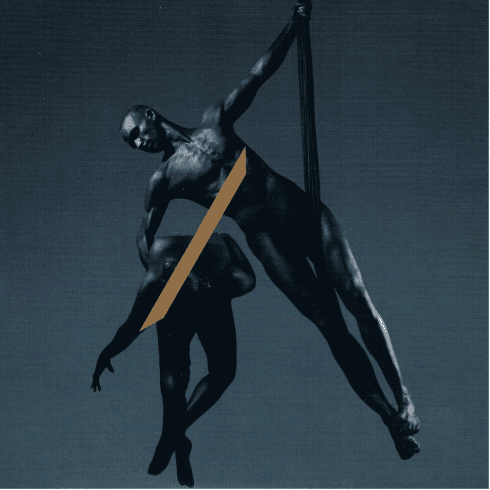 “Crepusculum” is the slow buildup serving as an introduction to the monolithic movement. Atmospheric, it sets the tone, and puts you in the water in preparation for what’s to come. The vocals start right when “Father’s Breath” hits. Serving as a bridge between the overture and the heavy-hitting “In Dialogue with Death”, the song evolves slowly, but ends in a flurry of blast beats, where the next one picks up; it’s one of the most intense moments on the album, impassionately crushing your whole being. During the third song, there is a spoken word passage, and those will be somewhat recurrent on the album; they really set a more obscure tone and add to the diversity found therein. “Diluculum” is only slightly less tense, if only because it has less the furious percussive blasts, but it is no less emotionally intense. Representing dawn, as opposed to the dusk of “Crepusculum”, I believe it’s our first foray into acceptance, and like its antipodal counterpart, it’s an instrumental track. “Consensus” breaks the vocal silence, and brings a good deal of clean vocals – choir-like, reminiscent of Gregorian chants, even -, which will be much more present in the next sides of the Triangle. I believe it presents us with the attained acceptance of death, of loss. It’s very Christian in its imagery, too, with Liturgic Latin passages and phrases such as “In three rays of light”, in direct reference to the Holy Trinity. I say Christian, but it might as well be Satanist, since both rely on the same mythology, but have fundamentally opposite views on it. Finally, “Awakening from the Dream of Life” is the last movement of The Process of Dying. It teaches us that death is the only awakening, and that, by learning to live with it, to know it, we will be alleviated of the burden of life. Thus ends part one of Triangle, a self-growing experience and a mentor on well-being and acceptance. The middle part of the album brings the notion of balance between the physical and the æthereal worlds. This side has a lot of atmospheric and ambient influences, ditching almost completely the harsh vocals in favour of clean chants like we heard in Consensus. This doesn’t mean it’s entirely absolved of all severity: there are still plenty of musical anger on this side, which is split in five motions. “The World Destroyed by Water” acts in a similar manner as Crepusculum: an opener, an introduction, but complemented with spoken words. I believe this is a reference to the diluvian creation myths found throughout the world, in many religions and belief systems – a physical phenomenon that either has a divine origin or explanation. Here, the flood is how God repenteth for creating Man and Beast. “Satori” is the epiphany, enlightenment, according to Zen Buddhism. Alternatively, the title could also come from the Latin noun “sator”, which means founder, progenitor, originator. There are plenty of low vocal harmonies in this song, which give it a solemn, almost sacred feel. These choirs are really well executed, and I must congratulate the band for taking the time and effort to do them like they did. On this song, as well as many others on Triangle, there are Latin lyrics, which is a great addition to the atmosphere of it all, and the sacred feel of the experience. “Metanoia” follows up with extreme drumming and tremolo picking atop which are, again, chanted lyrics. The title refers to a spiritual conversion, or fundamental change of mind, and the lyrics talk of transformation. On Metaflesh, the song also acts like a hinge, and there is definitely a change in sounds afterwards; I can’t really put my finger on it, but it’s tangible. “Above the Stars of God” is a very atmospheric song, almost psychedelic with the guitar solo there, played to great effect. It’s also one of the only moments on this side where there are harsh vocals, crying “I will raise my throne above the stars of God”. “Conclusion” closes the second third of the triptych with acoustic guitars. This part is very smooth and feels very hindsightly, retrospective and appeased, teaching us that we are “the light that we become“. We’ve come to know the spiritual and physical worlds, learned to accept them both, and live within them both. The last third represents the mastering of oneself, and the state of pure, total freedom. It is a striking departure from anything the band has ever done. The final part of their concept is shrouded in a mystical aura, and almost entirely instrumental. If the two first parts could be loosely attributed the label of black metal, this one totally escapes it. “The Third Ray of Light” commences and finishes as a World music ambient piece, tinged with folkloric elements of various cultures: here it sounds Mongolian, there Egyptian, and what’s most surprising is that everything is flawlessly performed. Not just on this song either, but on the whole record. “Cathartic Confession” takes back a small fraction of the metal edge in the form of one slightly distorted, or overdriven guitar. Breaking with the traditions put in place by the two first sides, this one also is an instrumental song. There are vocals, but they serve as yet another melodic instrument and do not convey lyrics. When they do, however, it is whispered and reversed, like in the beginning of “Jacob’s Dream”, which is a very ambient song, not really playing in the folk music territory anymore. It feels a bit drawn out and somewhat stagnant, but it’s the first and only point where it does, and that’s a statement to the quality of this record. “Maelstrom” is the second to last part of Triangle. Like most of The Supernal Clear of the Void, it is very quiet, minimalistic despite its name, and somehow I can’t help but feel like its meaning is deeper than it seems. That is, of course, until the tribal drums pick up halfway through, with chantings reinforcing that indigenous vibe. Ultimately, “The Empyrean”… the ninth heaven, the kiln of æther, the purest light, the finality of The Supernal Clear of the Void and Triangle, the only section in the third third where there are lyrics, and spoken to great effect. 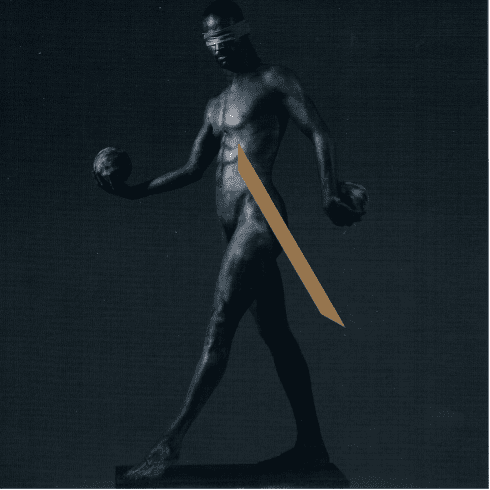 Underneath the very low, supernal speech are tremolo-picked riffs and atmosphere-thickening drum hits, summarizing everything we’ve experienced thus far in this Magna Carta of an album, in a rewarding fashion. In Roman script, this would be “om bhūr bhuvaḥ svaḥtát savitúr váreṇ(i)yaṃbhárgo devásya dhīmahidhíyo yó naḥ prachodayat“; it has been translated numerous times, but I have a fondness for William Quan Judge’s one: “Unveil, O Thou who givest sustenance to the Universe, from whom all proceed, to whom all must return, that face of the True Sun now hidden by a vase of golden light, that we may see the truth and do our whole duty on our journey to thy sacred seat.” It has an important place in Hinduism, as it represents the essence of the traditional upanayana ceremony. 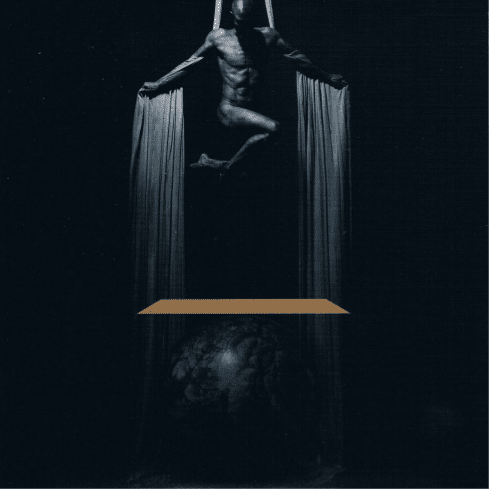 As stated in interviews with the lyricist, guitarist and singer Christopher Ruf, written as CSR in the booklet, Triangle is a very personal album where he expresses his own beliefs, taken from many religious and spiritual views, and long times of meditation and self-questioning. That’s why we get hints to Christian and Hindu mythologies, amongst probably many others that I haven’t caught. I believe it has been a difficult but delivering work of self-examination and humble sharing of experience. It seems impossible to pull off. Swallow the Sun tried, Dream Theater tried, countless others tried and failed to various degrees. Crafting an album is elaborate and difficult, making it a double – or worse a triple! – album is nigh unthinkable to do right. Yet, Schammasch very much succeeded. Every part of Triangle is excellent, from the progressive black metal of “The Process of Dying” to the ambient and Worldesque “The Supernal Clear Light of the Void”, betwixt which lays “Metaflesh”, bridging the two realms with its atmospheric avant-garde black metal. Each is birthed with the perfection of the Hellenic sculptors, shaping the amorphous sounds into a collection of cohesive music. It’s so eminent that we could wonder if the music did not flow on its own into this form of perfection, and what role did the musicians play as a medium, not unlike water to a riverbed: is it the sheer volition of the meaning that moves mountains, or is it the message that directs the unsentient? I feel it’s a bit of both, and like the cover art of the album, it’s a grey area. The musicians let the music speak by itself, but they themselves are unique channels through which inspiration flows, thus altering it very personally. Moreover, the physical presentation is an experience in itself: each of the three discs is inside a sleeve of its own, with dedicated artwork and track list, and the lyrics booklet provides new insight into the mind of its writer. Triangle will change you on a musical and spiritual level. It’s a selcouth occurrence, but it’s is a sublime and near-perfect triple album.